When it comes to replacement windows ratings, there are a number of factors that can assist you in finding the best energy efficient windows for your home in your price range. It gets a bit tricky though because the best windows for a home in a hot climate won’t have the ratings as a home in a cold, snowy climate. Nonetheless, understanding the main ratings can help you work with a knowledgable contractor to find the best windows for your home. U-value is a measure of how efficiently (or poorly) a window prevents heat loss. The U-value of a window is the measure of heat loss of the window assembly and generally ranges from 0.20 to 1.20. 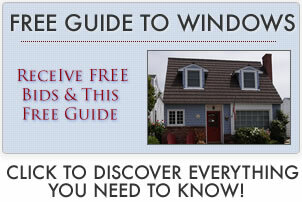 A lower U-value in a window means less heat loss occurs. As a rule of thumb, the best windows have a low U-value. Consumers should be looking for a window with a .30 U-factor or lower. AI or Air Infiltration is a measure of how much air passes through the window assembly (measured using the formula – cfm/sq ft). The is a number that range from 0 to 0.3. A lower AI value means less air passes through the window and frame assembly. The lower the AI, the better and more energy efficient the window. AI, along with U-factor are the two most important window rating numbers that consumers should be looking at when comparing replacement windows and deciding on what to purchase. Consumers should be looking for a .08 AI or lower. R-value is the insulating value of a window assembly and is effectively the inverse of U-value. Window R-values range from 0.9 to 3.0. The higher the R-value is, the better the insulating properties. As a rule of thumb, the best windows have a high R-value. SHGC or Solar Heat Gain Coefficient is a measure of how efficiently the window blocks out solar heat from sunlight. SHGC numbers range from 0 to 1, with 0 being no solar heat absorbed and transmitted through the window. The lower the SHGC, the lower the amount of solar heat that comes through the window. VT or visible transmittance is a measure of how much sunlight enters through your window. VT is a number that ranges from 0 to 1. A lower VT value means less light is entering through the window. A low VT means less fading of carpet and furniture over time. CR or condensation resistance is a measure of how well a window resists condensation forming on the inside surfaces. CR is a number that ranges from 0 to 100. A higher CR means better resistant to condensation forming. As a rule of thumb, the greater the CR value, the higer quality the window. STC or Sound Transmission Class is a measure of how much sound a window blocks out. STC is a number that ranges from 18 to 50. The higher the STC, the more noise is blocked out by the window. STC is affected by the amount of dead space between window panes (the more space, the better), the quality of air seals and the thickness of the window glass. The higher the STC, the better the window is at keeping out outside noises.